Arsenic, barium, cadmium, chromium, copper, lead, mercury, selenium, silver, and zinc are among the many contaminants that enter the environment through industrial, agricultural, or other human activity, as well as through natural causes. Addressing this requires identifying the site, characterizing it in terms of the level of contamination and then cleaning, removing, or isolating the affected areas. Determining the best course of action requires detailed and precise information on the contaminants that are present, which traditionally has been done in the lab. Recent advances in technology, however, enable accurate analysis in the field. Much of the laboratory analysis of contaminants in soils and sludge has been done using inductively coupled plasma-optical emission spectrometry (ICP-OES). Commonly accepted methods for ICP-OES analysis of soil and sludge involve sample digestion or extraction. But this is not useful for some special applications like determining the presence of antimony in soil, for example, because it might not bring antimony into the sample solution. For ICP-OES laboratory analysis, the sample that is collected in the field must be transported to a lab, where it would likely then be placed in queue. This method also requires extensive sample preparation, which can add hours to the process and in some cases actually be hazardous. If samples are not found to be in compliance with a designated target, adjustments must be made and the test process repeated, further extending time to results. An alternative method, Energy Dispersive X-Ray Fluorescence (ED-XRF) can provide lab quality analysis in the field, with minimal sample preparation. It provides accurate analysis for elements ranging from atomic number 11 (sodium) to atomic number 92 (uranium), which can shorten time to results from days to minutes. Samples prepared as loose dried powder can be analyzed easily in XRF sample cups for on-site applications without loss of precision or accuracy in comparison to the pressed powder technology typically used in a laboratory. The following tests were conducted in the field using a SPECTROSCOUT spectrometer, which is equipped with a transmission target X-ray tube (Rh target), a filter changer, a He purge system, and a high resolution large area SDD. The resolution of the SDD used amounts to <155 eV (Mn Kα) at an input count rate of up to 200,000 cps. All measurements are done under He purge with low He consumption. Alternatively, the same performance can also be achieved when using a small portable vacuum pump. The components are packaged in a small cabinet with a footprint of 31 cm x 31 cm and a weight of about 12 kilograms. Table 1 shows the measurement parameters. Before measuring each spectrum of an unknown sample, the shutter of the instrument is irradiated. This enables calculation of the line energy-channel position function and the line width-line energy relation, which is used to correct any spectrometer drift. The analysis time can be optimized depending on the analytical requirements. For a complete screening of the listed elements, a measurement time of 5 minutes per sample is sufficient. International standard reference materials were used for this report. In general, the samples have to be crushed and ground to get an average particle size of < 60 µm and dried. 5 g of the dried powder was poured into a plastic cup with an outer diameter of 32 mm and closed with a 4 µm thick polypropylene foil. With an optional sample spinner, the cups can be rotated during measurement. 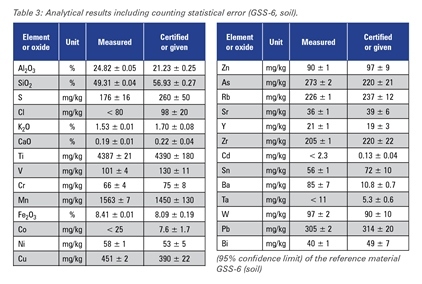 Calibration for major, minor, and trace elements was performed by measuring a series of international reference materials such as rocks, soils, industrial and domestic sludge, and ores from various sources such as NIST, IRMM, USGS, CRPG, GBW, AMIS, SARM, and others. Table 2 summarizes the calibration data and limits of detection. 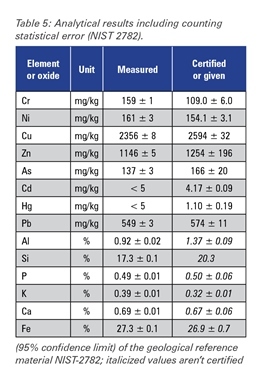 Matrix effects and line overlaps might increase the detection limits given in Table 2 due to various factors (e.g., Co traces in iron-rich samples). The excellent performance of the SPECTROSCOUT can be shown in this multi-element application. Analytical results for three different reference materials in comparison to the certified values are given in tables 3-5. 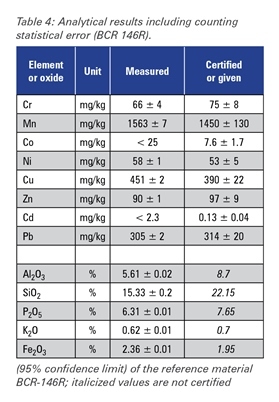 The accuracy of the measured concentrations for the "light" elements sodium, magnesium, aluminum, silicon, phosphorus and sulfur is limited by particle size effects caused by the differences in sample preparation technology of different producers and by mineralogical effects. The repeatability of the SPECTROSCOUT was examined by analyzing the sample NIST 2782 ten times over one day. 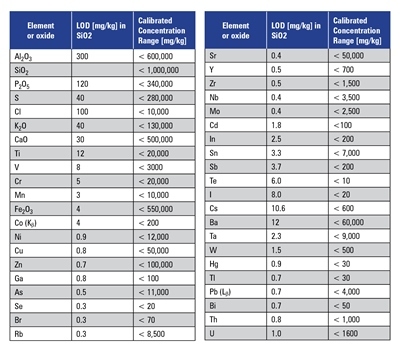 Table 6 shows the average concentrations and the standard deviation for the certified trace element content in the sample versus the certified values. 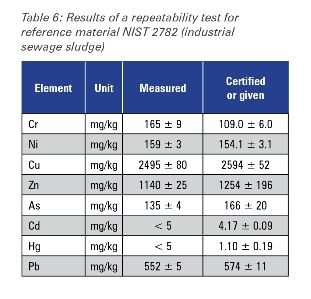 The data in Table 6, for all certified elements, demonstrate the excellent precision of the SPECTROSCOUT for the environmental monitoring of heavy metals in industrial sewage sludge. Field analysis using portable ED-XRF satisfies the needs of precision and detection limits for on-site analysis. It provides a fast, precise, accurate, and economic solution for in-situ analysis of traces of minor and major elements for environmental monitoring, geochemical prospecting, and mining applications using loose dried powders in plastic cups. Performance. ED-XRF instruments used in the field must have dependable accuracy, repeatability, and sensitivity across a wide range of detection levels, enabling precise analysis from high percentage amounts to trace element concentrations. Ease of operation. Consider who will be using this instrument as ease of use translates into greater productivity and lower training costs. Look for an intuitive interface, simplified software that interacts with a standard PC, and comes with predefined application packages and calibration tools. Cost. A portable ED-XRF instrument can cost as little as half that of a dedicated laboratory instrument. That's still a pretty solid investment. Be sure the system is designed for the application and is rugged enough to withstand operation in the field. Portability, compactness, and integral power supply. Weight, design, and transportability are all key factors in making the most of measurements in the field. If access to a power outlet might be a problem, be sure to specify an instrument that runs on batteries.